Note: This feature was added in Alfred 3.4, so you'll need to be using 3.4 or above to use Snippet Triggers. Snippet Triggers can be used to perform an action without showing Alfred, simply by typing a pre-set text keyword in any text field on your Mac. The Snippet Trigger is useful for cases where standard Snippets and Dynamic Placeholders aren't flexible enough. How can I use snippet triggers? To run a script that adds "Good morning! ", "Good afternoon!" or "Good evening!" to a snippet before pasting depending on time of day. Take a look at our tutorial on creating a Snippet Trigger Workflow using either a free text field or a list of pre-defined items. To add a snippet trigger, right-click on the workflow canvas to pop up the objects menu and, under Triggers, choose Snippet. 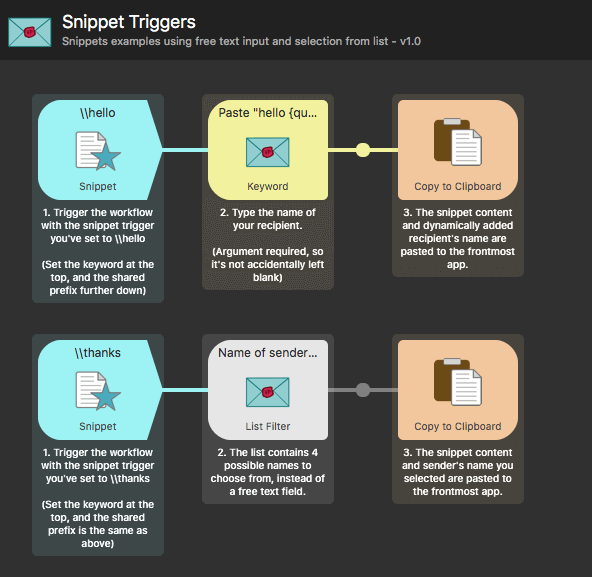 To configure the snippet trigger, set a keyword. Keep in mind that you'll need to type the prefix followed by your keyword. By default, the Shared Prefix is set to \\ with no Suffix set. For example, in the screenshot above, typing \\thanks would run the snippet trigger set above. You can change the Shared Prefix and Suffix, but keep in mind that this is shared across all of your Snippet Triggers, so it's best to use the default or set a clear and useful one from the start. If you exclusively want the snippet to trigger in a specific application, check the box for the Focused App Variable, and add the relevant app's bundle ID. When importing a new workflow, snippet triggers are stripped, as well as hotkeys. This ensures that the snippet triggers you set are relevant and useful for you, and don't clash with existing snippets or keywords you've already set. As such, you'll need to double-click to view the configuration of the Snippet object, and set it to your own trigger keywords. You can also use snippets-based actions in the Snippet text auto-expansion feature, so it's possible to create a snippet trigger object that conflicts with an existing snippet keyword. Workflows always take precedence when a keyword is used both in a trigger object and in a text snippet. 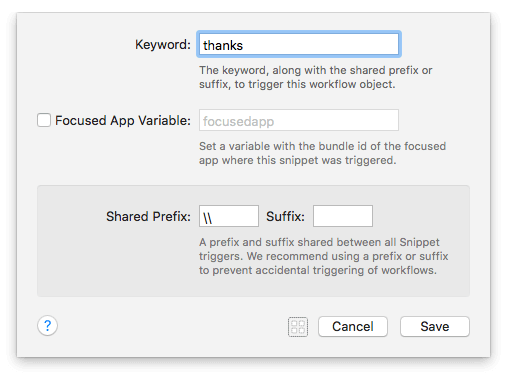 In other words, if you set the same keyword in a snippet for auto-expansion AND in a snippet trigger object, the workflow will take precedence and the conflict will only appear in red in the Snippets feature preferences, where you'll be able to change the keyword. We recommend using a prefix for your Snippet Triggers that is sufficiently different to your snippet keywords that these won't accidentally conflict.